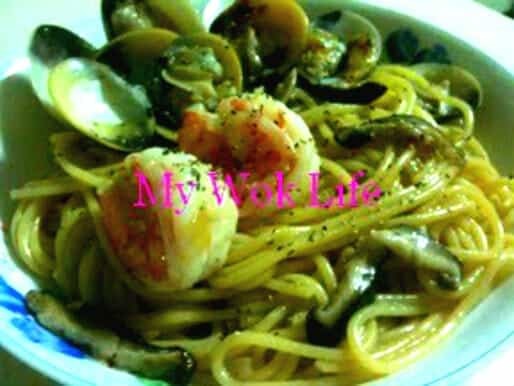 Called this recipe by listing out it’s main ingredients, I was not sure how to name this Japanese-Chinese-Western styles pasta dish. However, this recipe is rustic yet elegant. This classic homemade dish calls for spaghetti smothered in a hearty chicken stock with a touch of Japanese Mirin. The spaghetti strands drew in the full essence of chicken stock and made it so flavourful and tasty. It was a big hit by my family and surely mopped up the entire cooking, every time I cooked this pasta. Simple preparation with dazzling results makes this dish ideal for own indulgence, entertaining or any occasion. 500 grams of clams, washed and soaked in heavily salted water for at least 1 hour. 1) Boil a pot of water over high heat. Add salt and olive oil. Place spaghetti strands into boiling water and half cook the strands for 3 minutes. 2) In the meantime, heat olive oil in large pan over medium fire. Add in garlic and sauté till fragrant. Transfer half-cooked spaghetti from the pot to the pan. Add in chicken stock, salt and sugar. Stir fry to combine. 3) Then, add clams. Cover pan with lid. Reduce heat to low fire and simmer for 4 minutes, or until clams are cooked till shells opened and most of chicken stock is absorbed by the strands. 4) Remove lid. Increase heat to medium fire again. Add prawns and mushroom, stir fry for 1 minute, or till prawns are pinked. Add in mirin and stir fry to combine. Chicken stock in the pan should be thicken by now. Heat off and dish up. Sprinkle some black pepper (and parsley) to serve. A serving of my pasta dish counts about 380kcal. Tips: You may wish to briefly blanch the clams in separate pot first, before putting together with the spaghetti cooking. Discard any unopened shells. * Add more chicken stock to simmer the spaghetti if requires more gravy in your dish, or vice versa. Hi, been following your blog. thanks for sharing all the great recipes. I have been trying to find Mirin, but I just cannot seem to find it. Where can I get it? It’s easily found in major supermarkets e.g NTUC Fairprice, CS, etc. Find at Japanese products cells. It comes in bottle , its liquid is in light yellowish/ brownish colour, and its Chinese name is 味淋, or similar. Can I how do u make the chicken stock? DO u just use the chicken cubes or boil with chicken? I used the prepack chicken broth which comes in either can or packet, got it off the shelves. You may also use chicken cube or the broth from boiling one whole chicken with skin, simmer for an hour or so.